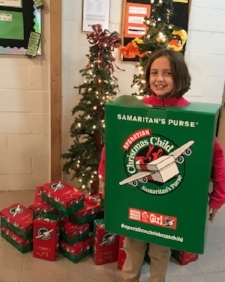 When Samaritan’s Purse began the shoe box ministry-Operation Christmas Child-in 1993, there were 28,000 boxes collected nationwide. 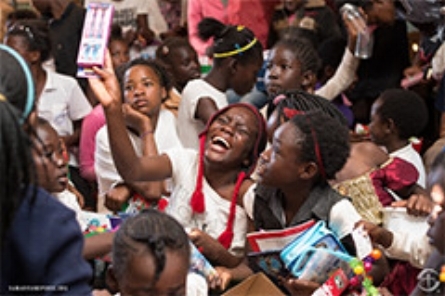 In 2012, they collected the 100 MILLIONTH gift-filled shoe box! In 2016 nearly 11.5 million children in over 100 countries around the world were impacted! Additionally, over 2.5 million children graduated from their discipleship program called "The Greatest Journey" and 1.6 million students made decisions for Christ. Countryside Bible Chapel serves as a Central Drop Off Location. What does this mean? A Drop Off Location is a centrally-located church/organization which serves as the area hub for shoe box gift collections. We receive gift-filled shoe boxes from the community, as well as the shoe box gifts collected by other Drop Off Locations. We are also responsible for making sure all these boxes reach their next destination in the journey–the Processing Center. We typically handle over 10,000 shoe boxes each year! You can deliver your gift-filled shoe boxes during our open hours and/or join our wonderful team of friendly volunteers who greet donors, receive their boxes, and pack them in cartons for shipment to the Processing Center! This year, our team in the MA Northeast Region received 14,262 shoeboxes! Well done everyone! And, thank you to everyone who filled a box, served at a Drop Off Location and prayed for the whole week!